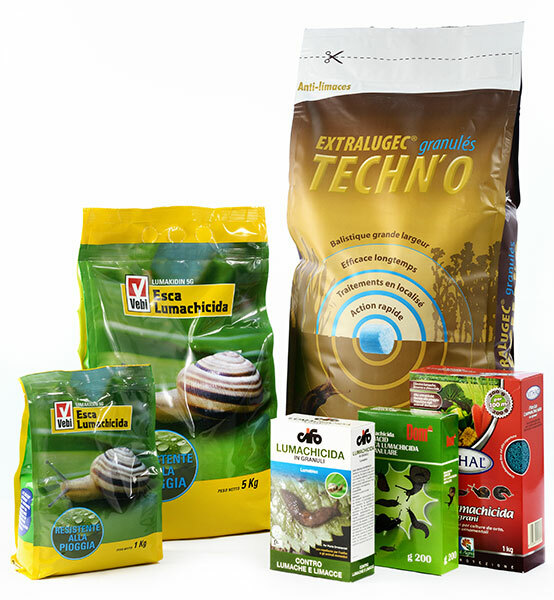 The pellet molluscicde bait produced by Industrialchimica is based on Metaldehyde, an active ingredient acting both on contact and on ingestion that is particularly effective in controlling snails, slugs and gastropods in general. The formulation contains also a bitter substance aimed at preventing accidental ingestion. The particular “Humid Manufacturing Process” used for the production, gives the blue pellets particular resistance to water (rain, watering), coupled with high palatability and long-lasting attractiveness, without the dustiness typical of “dry” formulations. The baits are ready for use, can be applied either by scattering or along the rows of crops in the field and are suitable for both amateur and professional use. Also the registrations of the molluscicde baits with own brand belonging to Industrialchimica can be granted for distribution by underwriting licensing agreements, both in Italy and abroad and, just like the rodenticide baits, Industrialchimica can again support its customers to get their own registrations for products having a specific trademark. Molluscicide baits can be packaged in plastic sachets (with or withour re-sealable zip) weighing from 200 g to 15 kg, in cardboard boxes (with or without dosing dispenser opening) weighing from 200 g to 1 kg and in 10-25 kg paper bags.